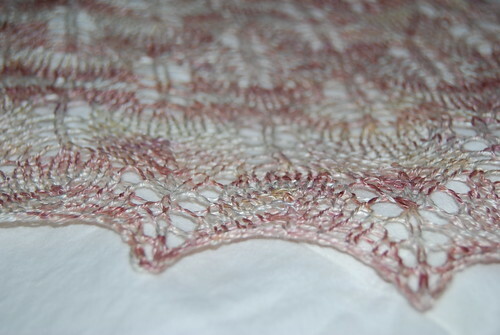 I thought I'd show you what came off the needles last November. Here is Kiri, done in Claudia's Handpaints 100% silk. It took less than a skein and size 3 Addi turbo Lace circs. The pattern was so easy to memorize that I could do it anywhere, even in the car, which is a nice thing because usually my lace projects have to be done at home. 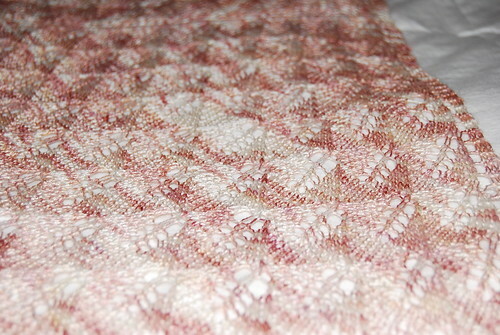 The silk was enjoyable, but I had to get used to it because I knit mostly with wool. 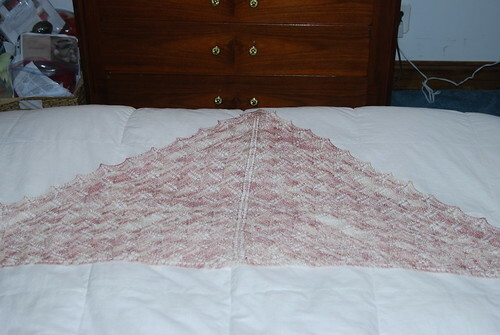 I highly recommend the pattern to any of you who feel less than adequate at lace knitting, or for anyone who needs a break from the chart intensive or more complex lace patterns out there. OOOO Donna! That is really pretty!! I can't memorize any pattern, ever. What is your trick?